Homemade Kiev Cake Recipe with Infused Buttercream is the dessert of your dreams. 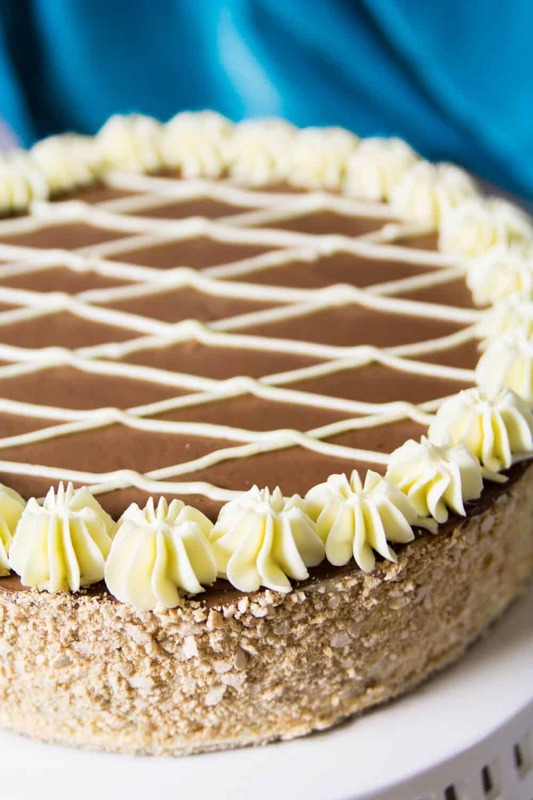 A classic Slavic dessert that combines rum infused buttercream, chocolate, and hazelnuts will make your taste buds scream with happiness. This recipe was originally posted March 16, 2016. We’ve tweaked it a bit since then. This post may contain affiliate links. Read my disclosure policy here. Kiev cake is perhaps one of the most well known Slavic cakes. 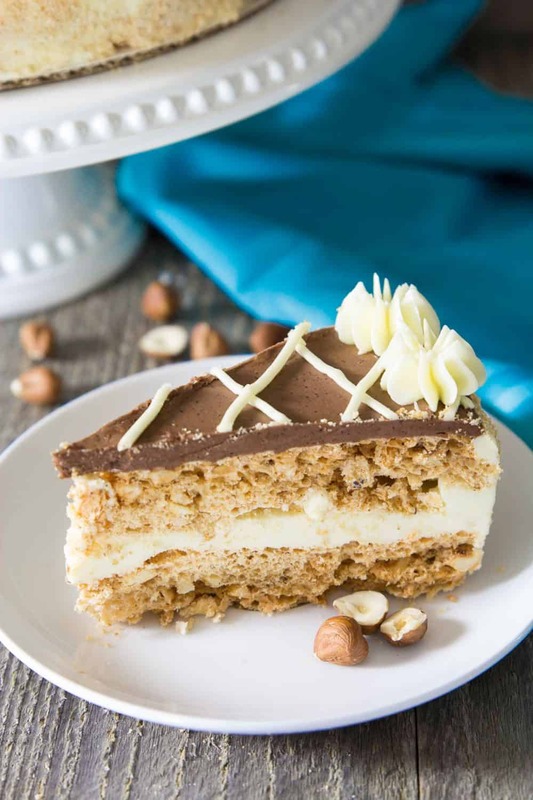 It is made with layers of crunchy hazelnut meringue (made with a little bit of flour) and Russian buttercream (a little different from regular buttercream). The original Kiev cake uses cashews instead of hazelnuts though. This is my mother’s tried and tested recipe. Since I grew up in the states so I’ve never actually tasted a real Kiev cake. Our local Russian store sells Kieve cakes made by the Roshen company. My father grew up in Kiev and he told me my mother’s cake is very similar to the Kiev cake he used to eat in his childhood. Prepare your baking pans and set aside for later. Combine ingredients as shown in printable option below to build the cake layer. Use a stand mixer for convenience to beat eggs until frothy as directed. Fold in egg and flour mixtures gently using a spatula carefully not overwhip the eggs. Create the cake layers as directed and top with chocolate buttercream. You may ice or decorate the cake as shown in my images, or as you prefer. While I love the flavors of this homemade kiev cake with rum infused buttercream, it can be a bit rich for every day. Below I am sharing even more of our best homemade dessert recipes for you to create at home. Enjoy these with your family! Below you can print the Kiev Cake directions and full ingredient list for your convenience. Homemade Kiev Cake Recipe with Infused Buttercream is the dessert of your dreams. A classic Slavic dessert that combines flavors in one rich dessert! Trace a 9 inch circle on 2 sheets of parchment paper. Set aside for later use. In a bowl combine wheat flour with 1/3 cup sugar. Then add the chopped hazel nuts and mix to combine. Add the cream of tartar and beat until soft peaks begin to form. Add the sugar and vanilla and beat until stiff peaks form. Gently fold in the hazel nut and flour mixture into the egg whites. Dab 5 dots of the meringue onto each baking sheet. Lay the prepared parchment paper on top (traced side down). This will help hold the parchment in place. Split the hazelnut meringue amongst the 2 (9 inch) circles. Try to spread within the lines as bet as possible. Bake at 300 degrees Fahrenheit for 10 minutes then drop the temperature to 220 degrees Fahrenheit, bake for another 3 hours and 45 minutes. Let the meringue cool completely. Place a 9 inch round pan on top and cut around the edges. Do this to both cakes. Reserve the outside edge that's been cut; you will need it to coat the sides of the finished cake. In a bowl lightly beat 2 eggs with 1 1/4 cup sugar. In a sauce pan, bring the milk to a simmer (not a boil). Slowly pour it into the eggs and sugar making sure to stir constantly. Pour the egg and milk mixture back into the saucepan and continue stirring over medium low heat until it becomes yellow and thickened. This may take up to 10-15 minutes. Remove the saucepan from heat and add the vanilla extract. Stir to combine. Let it cool to room temperature. 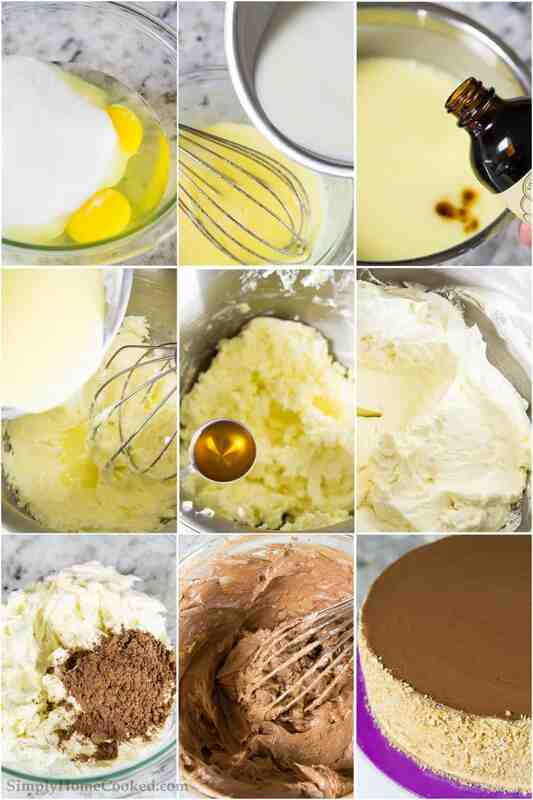 Beat the room temperature butter in a stand mixer using the whisk attachment. Pour in the cooled egg mixture while continuing to mix. Then add the rum. Reserve 1 1/2 cups of the butter cream. Combine it with 1/4 cup cocoa powder. Spread the white buttercream on top of the first meringue layer. Don't use up all of the white butter cream; reserve about 1/3 cup for decorating. Place the second meringue layer on top of the buttercream. Then spread enough buttercream to thinly coat the sides of the cake. Spread the chocolate buttercream on the top portion of the cake. Coat the sides of the cake with the left over meringue crumbles. From here, decorate the cake as you wish. Hi, my cake layers spread a bit in the oven and got flattened. Can you please give me more specific instructions on the meringue part. I would like to make another attempt at the cake. In detail help me understand: when you beat the egg whites to foamy, do you turn off the mixer and then add the cream of tartar? Same with the sugar addition, do you add it slowly while the mixer is running or all at once? How many more minutes do you mix for after the sugar addition? Hi Nell, when you add the sugar and cream of tartar you want the mixer to be on and running. 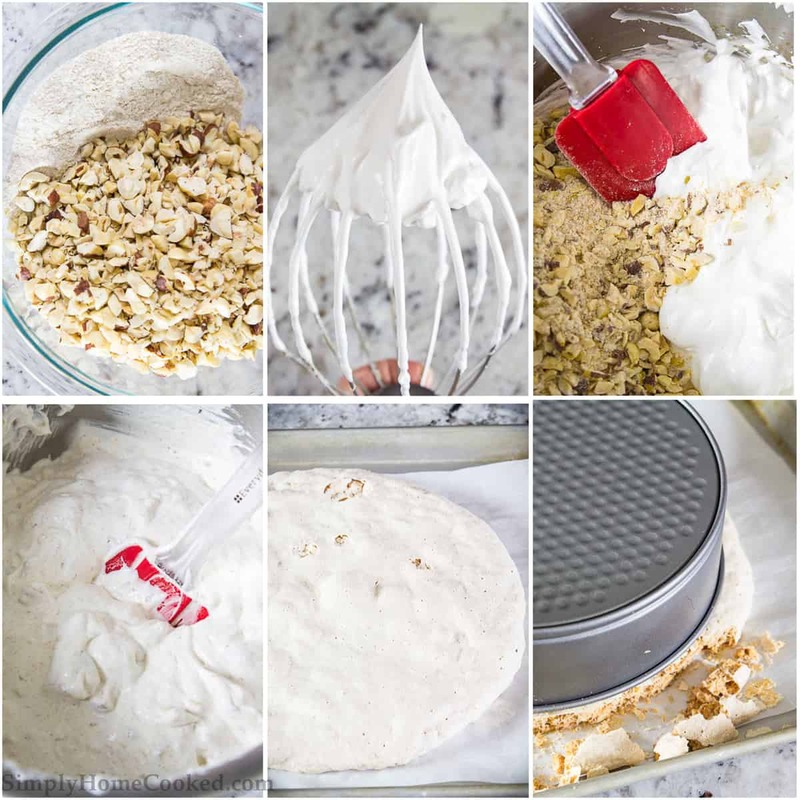 The time it takes to finish mixing the meringue really depends on the strength of your stand mixer. Look for stiff peaks to know that the meringue is done mixing. I hope you give this Kiev cake recipe another try Nell! I tried this recipe it was wonderful best cake ever. Thank you. Hi Ugena, I am very happy that you enjoyed this recipe! I hope you find many more recipes that you can enjoy on my blog 🙂 Thank you for the kind feedback! I am from Ukraine and that is the best Kievsky cake ever had. One important comment is I used Macadamia nuts as I couldn’t find Hazel nuts in fact it came out pretty good. Thank you for sharing wonderful ideas from your kitchen. Thanks for sharing the recipe for this iconic Ukrainian dessert. My boyfriend is from Latvia and is very fond of Kiev cake. We have bought the Roshen one a few times and this recipe comes very very close to it (except for the decorations maybe haha). My first attempt at the meringue was not the best, I think I added the sugar too quickly and the air came out. The second meringue didn’t turn out as thick as I wanted, maybe 1cm instead of 2 but was so good! Is there a technique to coat the sides of the cake with the meringue leftovers more efficiently? I found it a bit difficult to get it evenly coated. Do you have to worry about the meringue layers becoming mushy from the buttercream ? Hi Steve, don’t worry the meringue won’t get soggy as long as the cake is kept refrigerated. Why is there granulated sugar twice in the base recipe? Hi Liza, 1/3 cup is for the nut mixture and the other 1 1/2 cup is for the cake base. I am not a baker so the step by steps instructions are very helpful, thank you! I was wondering, how can I modify the meringue recipe to make a dessert in itself. Maybe pipping meringues or making cookie sized treats? How would the cook time need to be adjusted? I love Kiev cake but prefer to avoid the sugar & butter in buttercream yet enjoy my favorite part which is the hazelnut meringue. I was wondering if the cake could be made a day or two ahead of time and kept refrigerated or is the meringue too fragile? Thanks in advance for your reply. Hi Paula, yes the cake can easily be made in advance. It actually tastes best after being refrigerated. do you need whole wheat flour, or is regular wheat flour okay? I’ve seen best results with whole wheat flour. Do you think this would work if cocoa omitted? I’m allergic to it. I just made the meringue for this cake,love it!!!! I have tryed couple reciepts this one is the best so far ,the shape is not round but that needs to be trained 🙂 thank you,you just made my day!!! Thank you Virginia! Glad I could make your day ???? Made this cake this weekend. The recipe is quite authentic, very similar to the Rochen frozen ones but much better since it is fresh! It is quite a project to make though 🙂 mine didn’t look quite as perfect as the picture. Thanks for the good recipe. I had a little extra meringue left over, which I piped into some little cookies and baked for the same amount of time with the cakes. The meringue is very nice even alone. I would add a little salt to that part of the recipe next time though, maybe 1/4 tsp? Thank you so much for this recipe! Do you think it would crack if I double the recipe and make a taller cake ? You’re welcome Natalya. I’ve never tried doubling the recipe so I can’t really say much. There is a chance it may crack. The baking/drying time will be a lot longer if you double the recipe. This looks delicious! Can’t wait to try it. ???? Thank you Katy! I’m so glad you came across my recipe 🙂 if you make it, I would love to know how it turns out.